The program's re-worked user interface leads you to great results in the shortest span of time. Now, the program screen not only shines in bright, friendly colors, but has additionally been optimized for touch functionality. 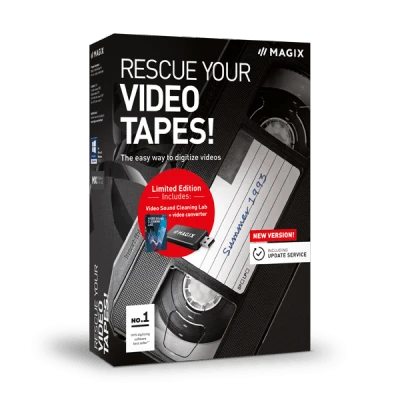 Starting now, you can also use Rescue Your Video Tapes! on the go, and no longer be bound to your home PC. Dubbing your videos just became child's play: With MAGIX Video Sound Cleaning Lab, optimizing sound in your videos is easy. Remove bothersome sounds like wind and camera noise, or adjust the volume of your recordings. In addition, you can add sound effects and audio commentary. "Smart Preview" is a technical innovation that let's you experience smooth previews without any delay, even during playback of high-resolution material. This way you can see how your videos will look later already during preview.